NAVONEEL is an all round astronomy exhibition and festival. Hosted biennially, this event sees a participation from hundreds of school and college students with over ten thousand visitors from all around the country. Over 100 astro photographs by SWAN members are displayed along with high end telescopes, cameras and other astronomy equipment. These are demonstrated to the visitors by specially trained school students who compete among themselves to win the grand trophy for the best demonstrating team. Along with this, the event hosts quiz competitions, fun games, attractive exhibits, all of which is FREE FOR ALL and OPEN TO ALL. Finally, as per tradition, the event is concluded on a Sunday with Moon observation through telescopes from a huge open field. Over 10 telescopes are set up and manned by school students who demonstrate the equipment to the general public and show them the Moon through the telescopes. Are you into astrophotography? Do you often target the skyscape? Or do you find ‘land and sky’ frames worth clicking? Then you must showcase your work to thousands of astronomy and sky enthusiasts. 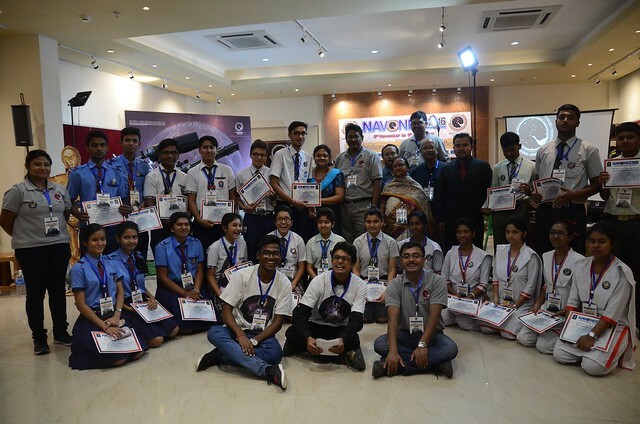 Send in your images and we will display them at ‘NAVONEEL 2019,’ the largest astronomy exhibition in Eastern India, if not the entire country. At the exhibition, your images will be displayed on screen with the image caption, your name and the location of photography. After NAVONEEL 2019 is over, all the image contributors like you will also be sent a thanks mail from SWAN with a certificate thanking you for your contribution. You will also be mailed a PDF album of all the photo contributions with the photo credits, image caption and the location of photography. and lesser than 10 MB each in file size. latest by February 10, 2019. It won't be possible for us to display any images submitted after the deadline. Send an image only if you have played an integral part in acquisition and/or processing of the image, and is in some way related to the sky, astronomy or rare atmospheric phenomena. The author of the image will be given full credit for the work and none of the images will be used for any commercial, publicity or distribution purposes.